The operational steering body of the European Voluntary Civil Protection Forum (EVCPF), the Coordination Council (CC), held its annual meeting on 2 September. On the 10th October 2013 some members of the European Voluntary Civil Protection Forum met in Vienna to discuss and prepare lectures and presentations for the 3rd Conference in November. The operational body of the European Voluntary Civil Protection Forum (EVCPF) met in Budapest on 2 September 2013. The experiences of the last years show that the number and intensity of disasters is continually growing, and as a consequence, they threaten our environment and the populations. In addition to economic losses disasters require significant losses in human lives. In the framework of the renewal process of the system of protection against disasters the citizens designated to civil protection organisations and the members of the Rescue Organisation “Bükk” established took oath on the 2nd of June in the county of Borsod- Abaúj- Zemplén. In Miskolc and on further nine settlements of the county approx. 1400 citizens designated to civil protection organisations and the members of the Rescue Organisation Bükk took ceremonial oath. The international conference Crisis Management Days was held in the city of Velika Gorica, Croatia on the fifth occasion on the 24-25 May 2012 in the organisation of the University of Applied Sciences Velika Gorica. At the conference Ret. Col. Dr. István Endrődi, the President of the EVCPF (European Voluntary Civil Protection Forum) and of the Hungarian Civil Protection Association (MPVSZ, the Hungarian abbreviation) took part accompanied by Ret. Lieut.-Col. Lajos Orbán. In the organisation of the Civil and Disaster Protection Organisation of the Capital there was a wreathing ceremony on the 11th of May on the occasion of the anniversary of the closing of the European wars at the memorial of the civilian victims of the bombings at the bridge abutment of Pest of the bridge Rákóczi. On the 2nd of March the Director General of EU ECHO received Ret. Col. Dr. István Endrődi, the President of the European Voluntary Civil Protection Organizations Forum and the representatives of the Coordination Council of the Forum. The President of the Forum informed Chief Director Mr. Sorensen of the establishment, activity, aim and plans of the EVCPF, asking for the efficient support of the EU. The Hungarian Civil Protection Association provides the possibility to participate to individuals and groups to participate in an international youth tent camp, organized by the Youth Fire Guard Association. By the support of the Directorate General for Enlargement of the European Commission a national Seminar was organized in Budapest, in the organization of the Europe House, where, in addition to the Hungarian civilian organization the representatives of the Slovak, Serb, Croatian, Slovene, Macedon, Kosovo, Montenegro, Bosnia-Herzegovina, Italian, Roman and Austrian organisations participated. Vice-President Dr. Imre Ország represented the Hungarian Civil Protection Association. We visited the Slovakian Representation of the European Commission on 24. January, in the organization of the European House. Vice-President József Schieber represented our Association. Mrs. Ingrid Ludvikova, Head of the Press and Information Department of the Slovakian Representation of the European Commission greeted our group, then Mr. Martin Pokorny, Head of information of the Slovak Youth Institute “IUVENTA” provided information of the implementation, results and experiences of the Slovak national plan of the European Year 2011 of Voluntarism. In Budapest, on 13. December the Coordination Council of the European Voluntary Civil Protection Organisations Forum (EVCPF) held a meeting in the Best Western Hungaria Hotel, where the representatives of the Austrian, Croatian, English, Hungarian, Slovak and Swedish member organisations participated. Ret. Col. Dr. István Endrődi, President of the Forum led the meeting. The next meeting of the Coordination Council of EVCPF was held on 13. December 2011, in Budapest. The meeting was headed by the Hungarian Civil Protection Association (MPVSZ) and the President of the EVCPF. Participants: representatives of the English, Croatian, Austrian, Swedish and Slovak member organizations. Connecting to the Day of Hungarian Science the scientific conference “Students in the service of science” was held on 10. November 2011., for the first time, with the purpose of tradition-creating, organized by the Scientific Association of the Hungarian Civil Protection, the Chair of Chemical- and Disaster Protection of ZMNE, the Technical Professional Branch of the Hungarian War Science Association and the Education and Consulting Scientific Association of BÉ. The Disaster Protection Directorate of County Békés, the Disaster- and Civil Protection Association of County Békés, the locality Dombiratos and the Rescue Group “Kőrös” organized and conducted a cooperation exercise in the second week of October. We participated in a visit to Bulgaria, organized by the Civil- and Disaster Protection Association of the Capital. In 2005 the leaderships of Civil Protection Association of County Bács-Kiskun, the Bajmok Voluntary Fire Brigade from Serbia, the Voluntary Fire Brigade from Croatia, the Tymbark Voluntary Fire Brigade from Poland, the Stambarg Voluntary Fire Brigade from Slovakia and the Sarmaság Fire Brigade from Romania – as the leaderships of civilian organizations – decided to hold International Youth Meetings for the youth membership (10 people) acting exceptionally, with the objective to make it possible for our youth membership to get to know the structure and practical activity of the Disaster protection organization of the neighbouring countries. Members of the Hungarian Civil Protection Associations’ National Presidency – Ret. Col. dr. István Endrődi, National President, Ret. Col. Vice-President for Economic affairs Attila Jósvai, Vice-President and Ret. Vice-Col. Vice President – made a professional visit to the Reconstruction Governmental Coordination Centre. As member of the Civil Protection Association the idea was borne in 2008 to organize a promotional and educational program series targeting the young adult age group. At the beginning the initiation was supported only by the Zala County Civil Protection Association, but after successful appearances now it is functioning by cooperation among counties and it has a national recognition. As I have mentioned several times, our target audiance is composed of young people who finished the secondary school. It is the multiple priority to inform and educate this group of people. From the 13rd to the 17th of July 2011, five days ulimited entertainment in Tokaj-Rakamaz at the Hegyalja Festival. Several thousands of young people attend this event so it is an excellent occasion for every civilian organisations to present their activities and call up the attention for themselves. So did the Hungarian Civil Protection Association too having graeat success among the young people. One of the largest challenge of the past period is to stop and balance the occurrence of damages and disasters. In Hungary an essential changing can be seen in the field of the modernisation and renewal of the defence/protection. Recently County Town Miskolc and the Miskolc Sub-Region have been stricken by both natural and man made emergencies, disasters several times. Miskolc is the town where, according to the classification of the current Hungarian laws, the most people are living in the highest vulnerability. At the beginning of 2011 our class got an invitation from the Public Safety and Disaster Management Working Group of the West Pannonia EU Region to represent Zala County at the Child Safety Olimpiad (Safety Tour) held in Austria. The 26th session of the Europe Union’s Director Generals for Disaster Management finished its work in Budapest. They explained their opinion about developing the preparedness of the experts. They listened to the reports about the civil protection cooperation with the neighboring countries from the heads of organisations keeping contact with the suthern and eastern neighboring countries. They could get information about the detailes of the mid May Estonian chemical and radiological emergency management exercise. They were biefed about the establishment of the European Civil Cooperation Forum (ECF) and the Polish Presidency presented itself. Events of recent decades show that the number of disasters is increasing year by year, their material effects are more and more significant, the number of effected population is increasing. On the meeting of national delegates held on the 12th of April the Hungarian Civil Protection Association (HCPA) discussed about the tasks and the preparation exercises done last year and about the plans for this year. In the general meeting the Director General of the disaster management and the President of the Association signed a cooperation agreement. The preparatory works of the European Cooperation Forum of the Voluntary Civil Protection Associations and the Regional Partnership Cooperation are finished. Recently in several scenes and times the preparatory works were done permanently and consequently for the success of the Forum being held at the end of April. As the newest station of the meetings targeting the acquitance with the professional and civilian people of the disaster management system, FS Lieutenant General Dr. György Bakondi, Director General of national disaster management attended the presidential seance of the HCPA (Hungarian Civil Protection Association) on the 11th of November. On the occasion of the International Civil Protection Day, on the 28th of February, 2011 the Zemplén Region Disaster Managament and Civil Protection Association held a festive commemoration in the Town Library of Sátoraljaújhely. 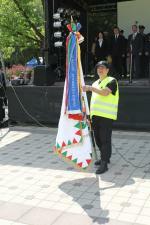 The event gave a tribute to the 76 years activities of the Hungarian Civil Protection. For the invitation of the National Predidency of the Hungarian Civil Protection Association an Estonian delegation of three persons visited our Association to learn about our national disaster management and the activities of the civil protection.